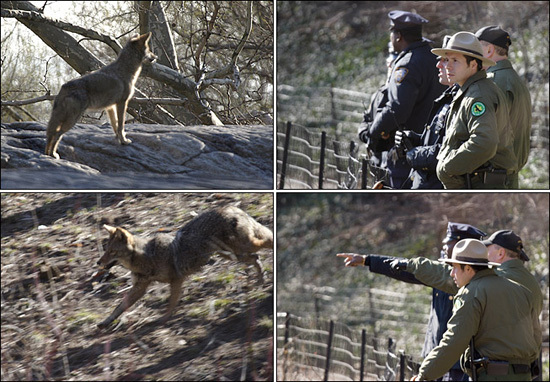 Because being wild — or even Nature, according to some — was never part of its program, Central Park had to put a stop to a coyote's sojourn within its precint. And so with reporters, photographers, and news helicopters in tow, New York policemen went on the hunt, finally capturing the intruder this morning. Of course, it would be an entirely different story if “Hal” the Coyote had settled just outside the park's boundaries. POSTSCRIPT #1: Another coyote article from The New York Times. Count 'em two! Two articles from the Times. Of course, they will soon be followed by a PBS special and then by an independent feature-length documentary directed by Werner Herzog. And finally a Hollywood sequel, Coyote Ugly II: about a girl's wild adventure in the big city, with dreams of becoming a songwriter, but one encounter with a tranquilized coyote changes all of that for the best and worst; the soundtrack will be awesome. So months go by, and a park ranger discovers another coyote who has somehow evaded detection all these time. And it's a female...with Hal's babies! An instant cult of Fauna Davidians is formed, rivaling Pale Male's own fan club. Hysterical coyote-watching day and night. Street vendors will start selling stuffed coyotes and t-shirts. A reunion of Hal with his mistress and offsprings is cooked up, and it will be televised live on The Today Show. Ratings through the roof! Madness! Madness! And Central Park, long the bastion of manufactured nature, will be decreed a wildlife sanctuary by mob rule, forever off-limits. Um... Our psychic paths have crossed again. Who I wonder would be the owner's of the TV or movie rights?